Carry Case For Sheets Of Gel. A convenient way to store, protect and carry your gels. 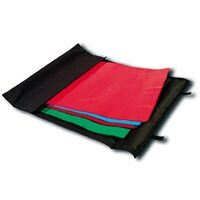 One large pocket holds up to 75 standard 20" x 24" sheets of gel. Features: Velcro secured closure, 2 large outer pockets, and carry handle.